Did you know, Frog can install a pre-built learning platform for you for free? Look at the points below. Do you have answer to each of these? a) Where are we now and is it where we need to be? b) What is our focus? Is it Teaching & Learning? Should we review our vision? c) Who is in your Frog team? Click here to see a supporting Hard Truths presentation. Needing help, click here to let us know what you're struggling with. a) Create a new team to drive and manage the platform this infographic may help you to decide who should be part of your team. b) Create a new implementation plan with your SLT - see example plan attached (MS Word*). c) Review your plan regularly. Revisiting your plan will help you set new milestones. 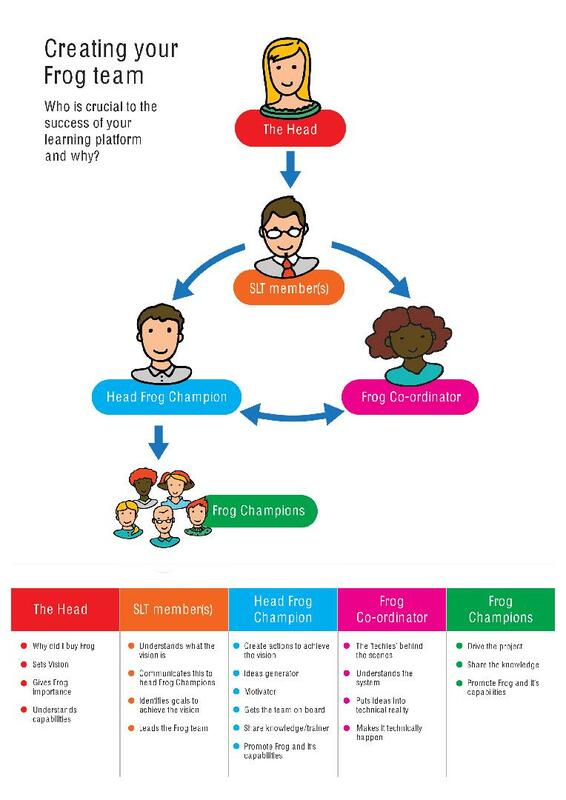 a) Set expectations for Frog champions, teachers and other users. b) Create a buzz. You can find posters here to help promote Frog in your school. c) Communicate your plans throughout the school.